We are very pleased to offer this property for sale in Lucky Bansko. The property itself is a very spacious studio apartment. At 37m2 it is very similar to many one bedroom apartments currently for sale in Bansko although few other developments are as desirable as Lucky Bansko. This 3rd floor property comes to the market fully furnished with a very reasonable asking price of just €18,000. If you are considering a property for sale in Lucky Bansko or indeed any Ski development you really do need to view this property before making a decision. Please click to see the full description of this property. 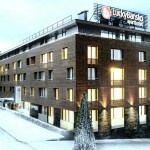 Location: Lucky Bansko complex is located at the entrance of Bansko, at the foot of the Pirin Mountain. The complex offers 67 studios and 47 apartments plus 1 Presidential apartment, in addition to a wonderful pool and spa centre as well as a 150-seater conference room and of course a beautiful restaurant and bar. Bansko lies 160 km (including 120 km motorway) south of Sofia (or about two hours’ drive from Sofia Airport). Accommodation: The Studios and the Apartments at Lucky Bansko Aparthotel are furnished luxuriously and stylish, with comfortable and practical furniture. All residences are equipped with TV sets, telephones, wireless Internet, mini-safe box and fully equipped and furnished kitchenette with coffee machines, ceramic plates, toasters, hot water jugs, refrigerators, microwave ovens, cutlery and dishes. The bathrooms are with bath tub, shower, and hair dryer and are supplied with bath cosmetic, slippers, full set of towels and bathrobes. Wine & Dine: Lucky Bansko Aparthotel offers a Le Bistro restaurant, a lobby bar, as well as round-the-clock room service to accommodate you. If you don’t want to leave your home atmosphere behind during your holiday you can prepare your favourite dishes by yourself. A fully equipped kitchenette, a rich variety of products and drinks in different sizes are offered at the Aparthotel store. Spa & Wellness: Lucky Bansko spa centre offers a variety of whole body massages, aromatherapy, peeling massages, cosmetic facial and lux therapies and electrotherapy. Fitness, steam bath, sauna, solarium and indoor swimming pool are at guests’ disposal. Bansko enjoys a picturesque location in a valley surrounded by Pirin, Rila and the Rhodopi Mountains. Bansko is considered to be the most developed Ski Resort in Bulgaria and Eastern Europe with a total length of 70 km ski runs. Bansko is not only a winter resort – today Bansko is all seasons Resort offering wonderful conditions for winter and summer tourism. Whether visiting Bulgaria for business or leisure purposes, Bansko is the perfect place where you can work or explore all that Bulgaria has to offer. Considering its architectural and historical value, Bansko becomes the pearl of all Bulgarian resorts. Being the biggest Bulgarian ski resort, Bansko offers great variety of luxury hotels, holiday apartments and family hotels.